The grocery bill: One of the big chunks of our family budget and probably our largest 'discretianary' item in the list of many family expenses. How do you save? I enjoyed this article in the Times, "Millions of coupons: Military shoppers score savings on base". It got me thinking about how we, you and me, can chunk down the amount we each spend on our weekly trips. It isn't always about coupons but they sure can help! The latest rave is coupons. I hear all about TLC's Extreme Couponing, although I have to admit I've never watched it. Are you an 'extreme-couponer'? My husband is the Sunday-morning newspaper coupon clipping addict. Every Sunday morning he is the first one up, grabbing the newspaper off the front sidewalk and the first thing he goes for is the coupons. He cuts what we use, clips what we might need, and puts them in our coupon organizer so that we can be ready to hit the grocery store at a moment's notice. His goal is to save over 30% in coupons on the grocery bill. That isn't /extreme/ like some of the gals on TLC but it is still significant. It is still money that remains in our wallets instead of our local grocery store's profits. If you are looking for some resources for coupons, beyond the Sunday paper, read through Tara Crook's piece, "Are you "Coupon" Extreme?" at USAA's Military Spouse Community. She has some additional points to think about as well as outside resources. I would add that hubs doesn't cut coupons for things we don't use. Sure it can be a great opportunity to try something new, but weigh that against how much it will ultimately cost, and is that just an impulse 'cut' or do you genuinely want to try it? Army Wife Network has had a Coupon Webinar a couple of times this summer. I'm waiting for the next one to pop up on my radar because I'm very interested. Knowledge is empowerment, after all! We don't live near a commissary; our closest one is about 5 hours away. I have yet to participate in DeCA's Guard/Reserve On-Site Sales program but I want to! We do, however, have a membership at a local wholesale club and we have our choice of about three different grocery chains in our area. Each week we get a flier in the newspaper or mail from each store and I take a good look at what the prices are for the items we use. Most of the time those fliers will determine where I am going to buy the family groceries that week. We love strawberries and in June we eat them abundantly. We love corn on the cob and in July we buy it weekly. Now in August, green peppers, tomatoes and watermelon top our list of favorites. Next month we will eat apples like there is no tomorrow! If it is in season it is much less expensive. Buying strawberries in December, as an example, is so expensive and seeing as they are being shipped halfway across the US to get to us they just don't taste that good. When foods are in season that you regularly cook with, take green peppers or tomatoes as an example, buy them in bulk when they are on sale. Chop them up and store them in serving size quantities. During the winter months you can pull them out and cook with them as desired. For items like apples or mangoes that don't freeze well buy a dehydrator and you can have tasty snacks through the winter: "Dried Fruit, a great on-the-go, money-saving, snack"
It sounds so simple but what a difference. Plan your shopping right after a good breakfast or lunch and you will be surprised at the little extras you /don't/ bring home. Of course this tip brings me instantly back to Keflafvik NAS, Iceland ... “Don’t shop when you’re hungry! No, no, no!” The AFRTS commercials on the radio and television stuck with us... and still stick with me twenty-years later. I suppose their mission is accomplished. This applies particularly for meat for our family. The large family packs of chicken, as an example, have way too many breasts for our young-family. However, usually the price per pound on these family-size meat packs is a lot less then a smaller pack of four breasts. So we buy the larger container and break it up into small freezer bags to store. We do this with hamburger as well (break it down into 1-pound bags at home). But we can take this concept beyond meat. Apply it to a bag of chips as we start the back to school season. If you are packing school lunches you can buy a large bag of pretzels or chips for a lot less then the individual servings. Pack the kids' chips from a large bag into a baggie or airtight container and you are saving yourself a bit of money each month. Sometimes bigger is less. Give yourself an allowance; set your budget; do what you have to do to not put groceries on a credit card that carries a balance from month to month. 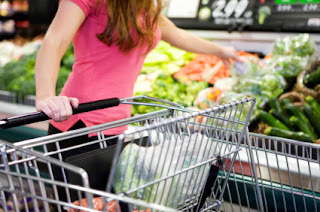 You will be more selective as you put things in your cart, and feel better knowing this week's food is paid for today, not next month with interest. I usually walk in to do the grocery shopping with a $100 bill. That's it. That is what I have. If I spend less I can put it in my jar for next week's trip, but I can't spend more. How do you save money when it comes to keeping your family healthy, well nourished and the cupboards full? Somethings take some forethought, like menu planning, other things might be no brainers, like comparing prices. I'd love to hear your ideas!